Frazzled by your local tailor for not getting the design and fit of your blouse right for the nth time? We feel ya sister! If finding that fitted fab blouse has left you combing the city, then here’s our list of places where you can buy readymade blouses to suit any occasion or style. Contemporary, edgy and oh-so-quirky! That’s brand Parama for you. Designer Parama Ghosh creates stories on fabric inspired by real-life incidents, stories, poetry, literature and cinema. Her hand-embroidered, brightly-hued blouses have fun motifs like Kolkata’s infamous yellow cabs and rickshaws, or kalbaishakhi, or local flowers like hibiscus, and the Kolkata skyline. Particularly noteworthy is the Telengana woman blouse and the Frieda Kahlo blouse. Make Aranya your go-to place for the ethnic and trendy blouses. Located between state emporium and Dakshinapan, this shop has a fine collection of stitched blouses in all sizes. Think: silk, tussar, cotton, thread work, prints and more. These can be mixed and matched with your favourite sarees to suit any occasion. This store inside a typical old Kolkata house is known for their amazing saree collection (apart from a whole lot of other stuff) but did you know that upstairs they also sell fabric and readymade blouses? Pick up a woven handloom cotton saree in eye-popping colours and match with a blouse - they have them in every size. This one is unlike any other shop in the city for the simple reason that they not only stock a range of festive-wear brocade blouses but also printed cotton, kalamkari, ikkat and tie-dye. All blouses come with attached padding. They also have shorts, with colourful thread and mirrorwork and short jackets. We bet you won’t be coming back empty handed from here. Roshnaai is a house of a wide range of stunning blouses in shimmer, velvet, raw silk and dual tone materials. Quite famous for designs like halter neck, deep back, Nehru collar, backless, stylish sleeves and more. This is one shop in the city that will astound you with the creativity and panache of its blouse designs. 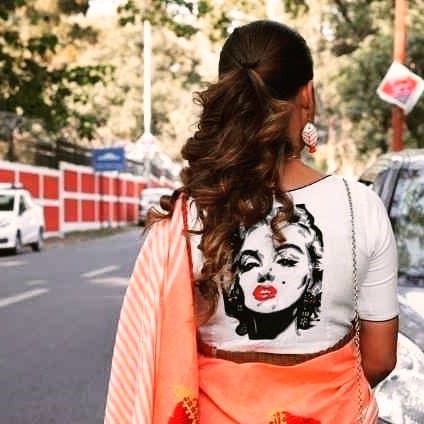 Let's face it, getting the right cut and fit for the most important piece of clothing that adds that magical touch to wearing a saree is a troublesome task. Enter to the rescue: Fashion World. It's a store full of stunning blouses that will amp up the look of even the most basic saree. Blouses aside, we were also left swooning over their corsets. We're talking fitted corsets, tailored with imported wires to give it the correct shape and fall. The oldest in the city, with over 50 years of experience in retailing all kinds of readymade blouses one can think of. Starting from the regular cotton blouses to printed & embroidered ones to net, tussar, brocade and more. Their bestselling, however are the floral printed blouses in summery shades. Backless, sheer, Chinese collar, halter tops and every other trending cut in V-cut’s readymade blouses collection can put even the most trendiest crop tops to shame. Their party wear blouses can be easily paired up with sarees, lehengas and even skirts to make them look more glamorous. The embroidered blouses that include intricate work like dabka, threadwork, zari, zardosi and many more with embellishments like buta, embroidered laces, colourful beads and stones, are total eye candies. Readymade blouses in prints featuring geometrical shapes, flowers, checks, stripes, abstract designs and more. You will find blouses in tussar silk and cotton with designer neck lines here. Shopping for a wedding? Go for their designer wear blouses in brocade with kalamkari. If you have daily wear on your mind, then pick the casual blouses in pastel and bold shades with stylish neck lines. How many times have you looked at a gorgeous kurta or blouse and let it go because the fit was just not good for you? The fabric, the design look great but it just hangs at your shoulders or sits too tightly across your chest or tummy. We've done that countless times at boutiques and stores. So imagine our delight when we stumbled across Kapaas Kolkata, a local Kolkata label that makes unstitched pieces that you can make into kurtas, blouses and whatever else you may wish. The best part about Kapaas Kolkata's pieces are that they are each one of a kind - all handmade, dyed and hand-embroidered in house.